The Daiwa BG saltwater spinning reels have become legends in the fishing industry. In this article, I will be doing the Daiwa BG 2500 Review. Is it the Best Inshore Saltwater Spinning Reel For The Money? Let’s cover the specs from the top down and find out. The newer version of the old infamous Daiwa Black Gold series, which stood the test of time for 35 years. Not many reel companies can say that. The old version was introduced in 1981. If you have been doing some saltwater fishing lately, there is a high probability that you might have seen this one. This one really set the bar for spinning reels. These reels are easy to use, easy to maintain, cost-effective and have a huge parts inventory to support replacement parts. Before I get to the actual Daiwa BG Review, a little history lesson on what might be the world’s best value spinning reel. I will cover the specs after that. So, stay tuned. 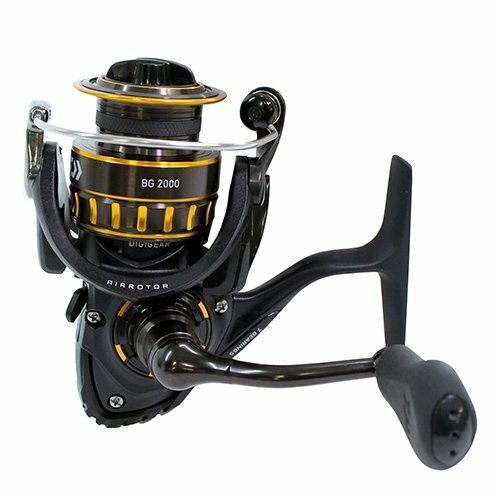 The Original Daiwa Black & Gold series, for a reel to stand the test of time of 35 years is actually pretty unheard of. Most of the companies change their models every two to three years. But, that’s not the case with Daiwa. It wasn’t until 2016 2017 that Daiwa actually decided to discontinue this reel. It was at that time they introduced the newer and improved version of that lineup. Which I think deserves the title for the Best Inshore Saltwater Spinning Reel For The Money. The only similarities you can find between the old model and the new one is in the color scheme. That’s really where the similarities end. The new BG is a complete overhaul redesign of the original black and gold series. It really showcases Daiwa’s latest technologies all for less than hundred bucks. There’s a lot of value in this reel. It really is a reflection of how far the fishing industry came in the last 35 years. The PG is available in 10 sizes. I’m doing the specific review of the 2500 model. I feel there is a sweet spot in the lineup and this is the one. They are all saltwater rated. It’s a great utility size to get started with. Without further ado, let’s get on with the Daiwa BG Spinning Reel Review. 190 yds of 10 lb. braid line capacity. 13.2 lbs. of drag capacity. The BG has a nice plastic drag cap. If you look at it in relation to the rest of the spool, it sits pretty high in. It has a nice offset design and that’s super comfortable. If you’re searching for your drag cap in the middle of the night fighting a fish, there’s no way you can miss setting your drag with this big cap. The cap is sealed top to bottom which Daiwa calls it their waterproof ATD drag system. ATD stands for automatic tournament drag system. It allows a little bit of slip when a fish takes your line and it’ll go to the preset drag setting. The Daiwa BG 2500 Spinning Reel is rated at 13.2 lbs. of drag. This drag system is all carbon discs and it’s super smooth. It comes with Daiwa’s proprietary drag oil and it is as smooth as it gets. The BG has an all-aluminum spool. It’s well-balanced. This spool is “braid ready”. Unlike the original black and gold series which was mono friendly only. This BG has a braid backing band that allows you to tie a direct braid. It also has line capacity rings which really help you when you find a big fish and gives you an idea of how close you’re getting to the center line spool. The line capacity on the spools is just absolutely massive. They do run a bit large compared to other spinning reels out there in the industry. The braking capacity really sets the Daiwa reels apart. The Daiwa BG 2500 has a 120-yard line capacity for 30-pound braid. The BG is top heavy by design. It tapers out from the bottom up and if you look at the spool, you can tell that the spool itself is a little top-heavy. Daiwa believes that a top-heavy design provides better casting distance. You can use it for surf fishing and it casts really far. The Daiwa BG’s rotor has what Daiwa calls their air rotor design. They basically take as much material as possible to create as much of a rigid experience as possible with the least amount of material. The rotors are pretty massive. It seems like there’s a lot of bulk but there’s actually not a lot of material. They use these larger designs with a lot of cutouts to give you maximum stiffness with the least amount of weight. The BG doesn’t have an aluminum rotor. It has a plastic rotor and that’s a good thing. using graphite for the rotor allows a price point to come in a hundred bucks for the entire reel. It’s just another part that’s cheaper to buy, cheaper to maintain and cheaper to replace. The Daiwa BG has a stainless-steel bail wire. It feels a little flimsy to the touch. But honestly, it does the job. This reel is designed to look rugged, be rugged and feel rugged. The bail wire ends in an older line drop design. The line roller itself has one ball bearing. The bail trip mechanism is a little soft. I think the spring could have been a little stronger. 1500 to the 4000 size features an automatic bail trip. Its body is designed with what Daiwa calls a Hard Bodyz design. It’s all aluminum. With the exception of a really cool plastic rugged bottom plate. The body itself is super rigid. It’s about as firm as it gets for a 2500 size aluminum reel. Nice long reel arm. Average sized reel foot. No complaints here. It’s solid. The ball bearings used in the Daiwa 2500 spinning reel are Minebea ball bearings. It is designed for heavy-duty saltwater use. The main gear is absolutely massive. It’s cast zinc. It still feels really good and should provide a lot of durabilities or the life of this reel. It has a 5.6:1 gear ratio. This gear ration coupled with the Minebea ball bearings and the oversized BG gear feels super smooth. This Daiwa bg 2500 reel has an infinite anti-reverse system. It comes with an anti-reverse switch. It’s small tight to the rotor and completely out of the way. The 2500 spinning reel features a single piece non-collapsible all aluminum machined handle. It has T-shaped rubber designed handle. If you are cranking up fish from the deep this design is really great for that. It allows for a comfortable hold and allows you to put a lot of leverage if you’re pulling up heavy fish from the deep. the handles interchangeable from left to right. A quick comparison of the Daiwa BG Series 2500 and 3000. 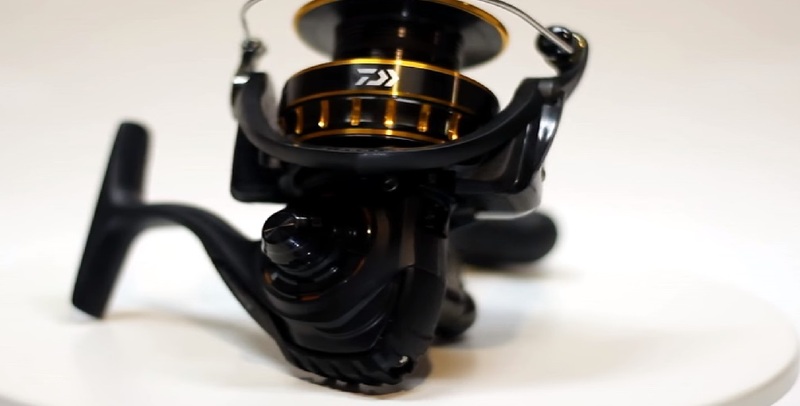 While researching for the Daiwa black gold review, I’ve come across a lot of different reels. 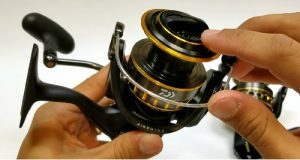 For comparison sake, the Daiwa black gold 2500 will give you the best bang for the buck for inshore saltwater anglers. No wonder the Daiwa inshore spinning reels are popular among anglers. Impressive quality at a reasonable price. For inshore saltwater anglers, there is no shortage of saltwater spinning reels. I know, it’s frustrating to actually pick a single one because there are so many inshore spinning reels out there. However, because there is so much hype about this specific model that I had to see it for myself. So, that’s the Daiwa BG 2500 review. Is it the Best Inshore Saltwater Spinning Reel For The Money? Let me know what you guys think in the comments below. I totally agree, after buying a BG4500 and a BG2500 I cannot fault either of them.